Multivariate pattern analysis (MVPA) reveals how the brain represents fine-scale information. Its power lies in its sensitivity to subtle pattern variations that encode this fine-scale information but that also presents a hurdle for group analyses due to between-subject variability of both anatomical & functional architectures. Haxby et al. (2011) recently proposed a method of aligning subjects’ brain data in a high-dimensional functional space and showed how to build a common model of ventral temporal cortex that captures visual object category information. They tested their model by successfully performing between-subject classification of category information. Moreover, when they built the model using a complex naturalistic stimulation (a feature film), it even generalized to other independent experiments even after removing any occurrences of the experimental stimuli from the movie data. In this example we show how to perform Hyperalignment within a single experiment. We will compare between-subject classification after hyperalignment to between-subject classification on anatomically aligned data (currently the most typical approach), and within-subject classification performance. We start by loading preprocessed datasets of 10 subjects with BOLD-responses of stimulation with face and object images (Haxby et al., 2011). Each dataset, after preprocessing, has one sample per category and run for each of the eight runs and seven stimulus categories. Individual subject brains have been aligned anatomically using a 12 dof linear transformation. Now we’ll create a couple of building blocks for the intended analyses. We’ll use a linear SVM classifier, and perform feature selection with a simple one-way ANOVA selecting the nf highest scoring features. We start off by running a cross-validated classification analysis for every subject’s dataset individually. Data folding will be performed by leaving out one run to serve as the testing dataset. ANOVA-based features selection will be performed automatically on training dataset and applied to testing dataset. For between-subject classification with MNI-aligned voxels, we can stack up all individual datasets into a single one, as (anatomical!) feature correspondence is given. The crossvalidation analysis using the feature selection classifier will automatically perform the desired ANOVA-based feature selection on every training dataset partition. However, data folding will now be done by leaving out a complete subject for testing. 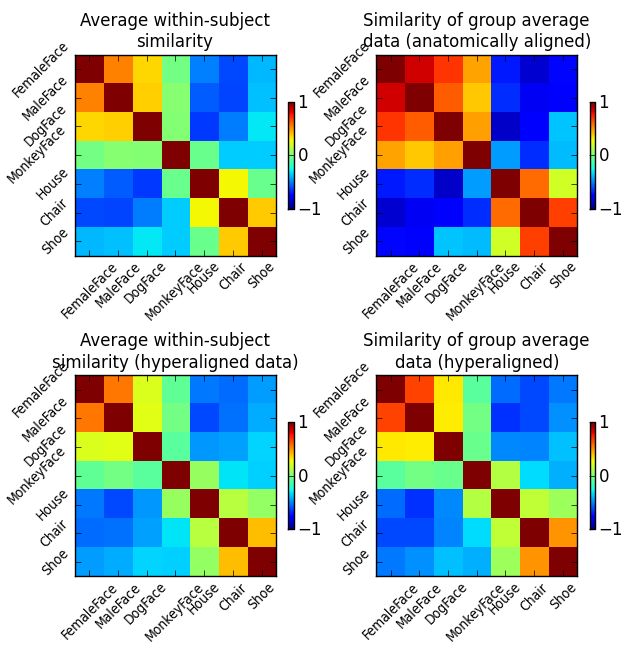 Between-subject classification using Hyperalignment is very similar to the previous analysis. However, now we no longer assume feature correspondence (or aren’t satisfied with anatomical alignment anymore). Consequently, we have to transform the individual datasets into a common space before performing the classification analysis. To avoid introducing circularity problems to the analysis, we perform leave-one-run-out data folding manually, and train Hyperalignment only on the training dataset partitions. Subsequently, we will apply the derived transformation to the full datasets, stack them up across individual subjects, as before, and run the classification analysis. ANOVA-based feature selection is done in the same way as before (but also manually). # Perform hyperalignment on the training data with default parameters. # same number of samples and time-locked responses are assumed. # same order as the list of datasets we passed in. # by running the test dataset through the forward() function of the mapper. First we take a look at the classification performance (or accuracy) of all three analysis approaches. verbose(2, "between-subject (anatomically aligned): %.2f +/-%.3f"
It is obvious that the between-subject classification using anatomically aligned data has significantly worse performance when compared to within-subject classification. Clearly the group classification model is inferior to individual classifiers fitted to a particular subject’s data. However, a group classifier trained on hyperaligned data is performing at least as good as the within-subject classifiers – possibly even slightly better due to the increased size of the training dataset. To get a better understanding of how hyperalignment transforms the structure of the data, we compare the similarity structures of the corresponding input datasets of all three analysis above (and one in addition). Average similarity structure of the individual data. Similarity structure of the averaged hyperaligned data. Average similarity structure of the individual data after hyperalignment. Similarity structure of the averaged anatomically-aligned data. Similarity structure in this case is the correlation matrix of multivariate response patterns for all seven stimulus categories in the datasets. For the sake of simplicity, all similarity structures are computed on the full dataset without data folding. We then plot the respective similarity strucures. Fig. 1: Correlation of category-specific response patterns using the 100 most informative voxels (based on ANOVA F-score ranking). We can clearly see that averaging anatomically aligned data has a negative effect on the similarity structure, as the fine category structure is diminished and only the coarse structure (faces vs. objects) is preserved. Moreover, we can see that after hyperalignment the average similarity structure of individual data is essentially identical to the similarity structure of averaged data – reflecting the feature correspondence in the common high-dimensional space. According to Xu et al. 2012, Hyperalignment can be reformulated to a regularized algorithm that can span the whole continuum between canonical correlation analysis (CCA) and regular hyperalignment by varying a regularization parameter (alpha). Here, we repeat the above between-subject hyperalignment and classification analyses with varying values of alpha from 0 (CCA) to 1.0 (regular hyperalignment). The following code is essentially identical to the implementation of between-subject classification shown above. The only difference is an addition for loop doing the alpha value sweep for each cross-validation fold. Now we can plot the classification accuracy as a function of regularization intensity. Fig. 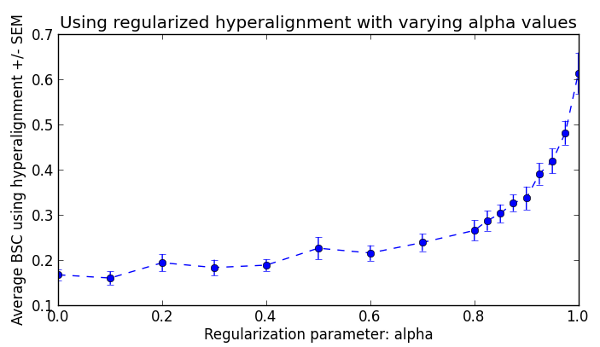 2: Mean between-subject classification accuracies using regularized hyperalignment with alpha value ranging from 0 (CCA) to 1 (vanilla hyperalignment). We can clearly see that the regular hyperalignment performs best for this dataset. However, please refer to Xu et al. 2012 for an example showing that this is not always the case. The full source code of this example is included in the PyMVPA source distribution (doc/examples/hyperalignment.py).